Expenditures and expenses are terms, which are used in the preparation of financial statements. An expense is a cost that has been incurred by an organization or company to earn revenues during a specific period. Expenses are reported in the income statement that is prepared annually. Companies record cost of goods and services sold in a specific period to be expensed. Other expenses that are recorded by organizations include advertising, salaries, interests, utilities, and rent among others. Expenditure refers to the amount incurred by a company or an organization after purchasing an asset or reduction of liability among others. Expenditure covers all the costs incurred by the companies in their purchase of goods and services or payment of recurring expenses. For example, the amount incurred to offset a liability is referred to as expenditure and not an expense. Their meaning or the context under which they are used can differentiate expense and expenditure. Expenditure is highly used to depict payment or disbursement incurred by an organization to purchase an asset. Besides, expenditures are also incurred after the settlement of liabilities. On the other hand, expenses are regular costs that are used to generate revenues in an organization. They include utilities bills, salaries, advertisement costs, and rent, maintenance, and transportation costs. 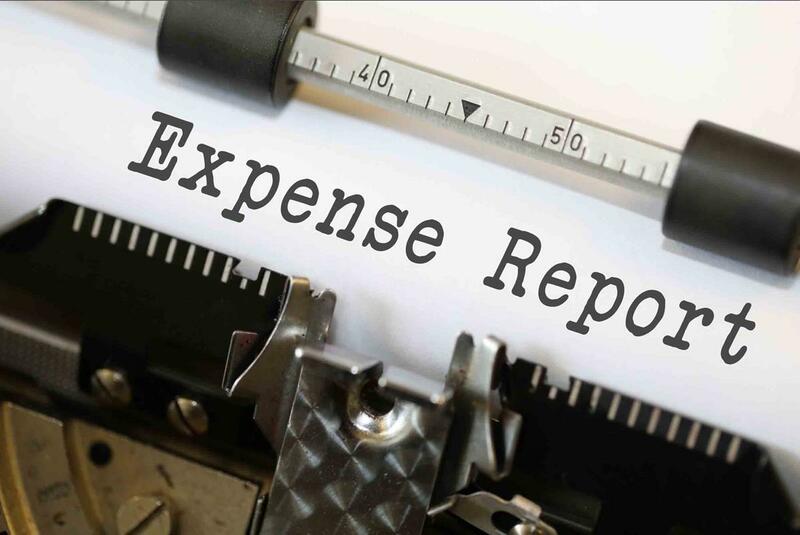 Expenses have a direct impact on the statement of financial position because they will appear as the costs incurred by the company to earn revenue. Expenses are recorded after the cost of goods where the amount incurred to cater for the requirements, which include salaries and other utilities, is subtracted from gross profit and the resulting amount gives the net profit. Total expenditures do not have a significant impact on the statement of financial position and are not recorded in this report. The duration a which expenses and expenditures are incurred tend to vary in length. Expenditures cover long-term costs of the organization while expenses cover short-term costs of the body. 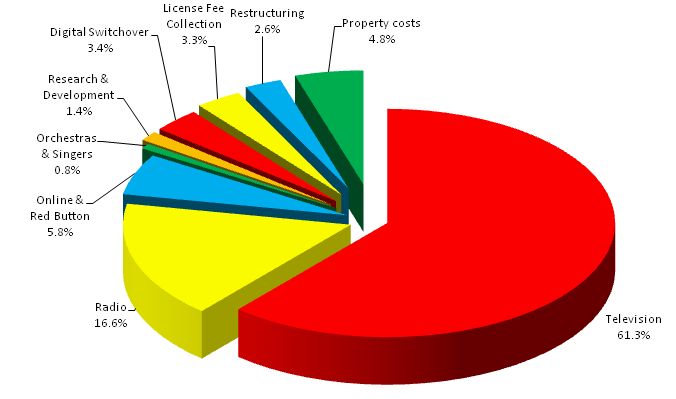 For example, an organization will incur expenditure in buying land to build new premises. This property will last for a significant period. On the other hand, companies will be required to pay expenses on a recurrent basis. For example, salary expenses are paid on a monthly basis while maintenance costs are incurred when equipment needs maintenance. The number of times through which expenditure and expenses occur on a single aspect is significantly different. For example, an entity will only incur single investment when purchasing equipment that will be used for production purposes. Besides, just the initial installation costs will be required to make the machinery operate. This is not the same for expenses, which will be incurred severally for the same aspect. The company will be required to pay for depreciation expenses for the number of years that the new equipment will be in service. The company incurs expenditure to help it establish itself so that it can be able to operate. This means that the company cannot run without incurring capital expenditure. Buying of original equipment, land, buildings, and other long-term investments of the company, which include all the physical aspects fall under the capital expenditure of the organization. On the other hand, expenses help the business entity to run on a daily basis. These costs enable the day-to-day operations of the company to run smoothly. Expenses pay for necessary aspects of labor, water, raw materials, and electricity, which are all essential ingredients for the normal operations of the company. The expenditure of the organization is not anticipated because the company expects the machines bought are scheduled to operate for a specific duration of time. The purchase of capital expenditure will only be incurred after a breakdown of equipment or when the entity wants to expand its operations. Incurring capital expenditures requires critical planning and necessary research because large amounts of money are incurred followed by high maintenance costs. General expenses are highly anticipated which makes entities to provide for unforeseen circumstances. For example, companies usually place money in imprest control system to cover for recurrent expenses. Moreover, companies usually anticipate their expenses, which are fixed. For example, wages, salaries, and provision for depreciation expenses. Expenditures and expenses are terms used in the accounting department to refer to the costs incurred by the organization. Expenditures are costs incurred when purchasing assets for the company or paying for a significant proportion of company liabilities. Expenses refer to the costs incurred by enterprises so that they can gain revenue. Some of the costs include salaries, utilities, transportation costs, and depreciation expenses. 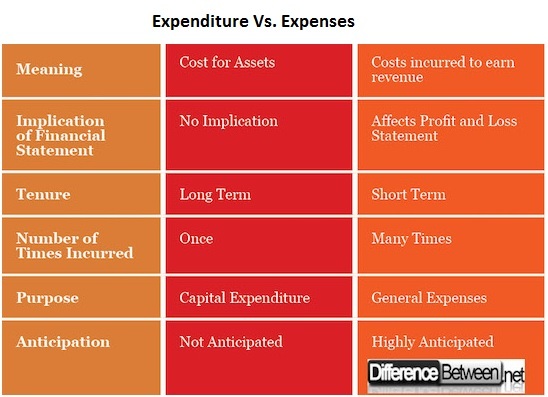 Other differences between expenditure and expenses include implications on financial statements, tenure, number of times incurred, purpose, and anticipation. Jecinta Morgan. "Difference Between Expense and Expenditure ." DifferenceBetween.net. 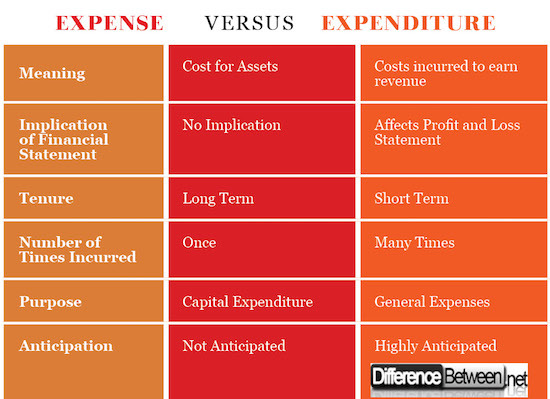 September 11, 2018 < http://www.differencebetween.net/business/difference-between-expense-and-expenditure/ >. The chart is completely the opposite! The headings should be reversed! McConnell, John J., and Chris J. Muscarella. "Corporate capital expenditure decisions and the market value of the firm." Journal of financial economics 14.3 (1985): 399-422. Stanger, Abraham M., Henry P. Vander Kam, and Pearl Polifka. "Prepaid Income and Estimated Expenses: Financial Accounting Versus Tax Accounting Dichotomy." The Tax Lawyer (1980): 403-426.